Dr Annette Herz: Coordination of publishing activities, print, dispatch and archive of Bulletins. The general goal of the commission is to supervise and coordinate all publishing activities of IOBC / WPRS. It aims at maintaining an acceptable quality level of the publications and the housestyle of the organisation as much as possible. 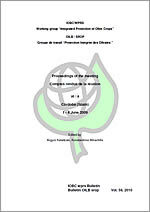 The bulletins comprise proceedings of meetings of Working- and Study Groups, reports of activities of the Council or Commissions, and proceedings of the WPRS General Assembly. The Bulletins appear 8 - 10 times per year. The brochures contain guidelines defining methodologies useful for the daily practice in Biocontrol and IPM (e.g. visual survey in orchards, monitoring methods, insect pheromone list, guidelines to evaluate side-effects of pesticides to non-target organisms).